Thanks to authors like Cece Bell and Raina Telgemeier, young readers have a wealth of autobiographical graphic novels to cling to when adolescence gets rough. 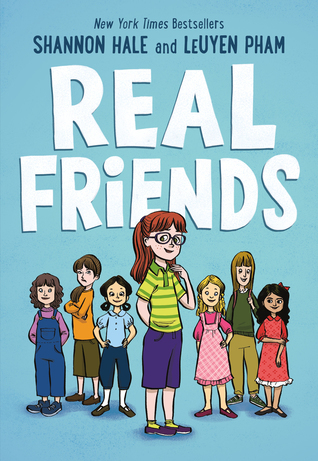 I love that these books provide hope for readers who feel awkward and friendless; that they all grew up to become authors and accomplished people is highlighted at the end of the books. 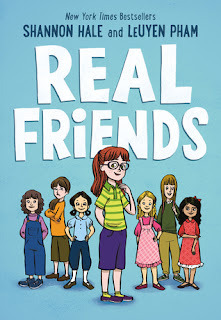 Shannon Hale's Real Friends details how she falls in and out of the group of popular girls throughout elementary school. It is such a common occurrence: sweet and slightly immature girls who are constantly on the razor's edge of acceptance. As a teacher, I see it and want them to know how special they are. Handing them this book could be one way of doing so. There is a happy ending, but enough stays unresolved that it feels realistic. Some girls will always be mean and some friends aren't worth giving up what's special about you. Being true to yourself is a theme that bears repeating over and over for middle grade readers.